When a covered employee suffers a qualifying injury arising out of employment, Maryland Workers’ compensation provide an avenue for financial compensation and other benefits. In certain cases, the work-related accident can even result in temporary or permanent disability. Though the benefits available under Maryland law do change based on the type of disability. On a related note, Iamele & Iamele provided a breakdown of workers’ compensation benefits for temporarily disabled workers a few weeks. Interested readers curious to know more about temporary benefits can learn more here: Comparing Temporary Workers’ Compensation Benefits in Maryland. Returning to the topic at hand, there are two types of workers’ compensation benefits available to qualifying permanently disabled employees in Maryland — Permanent Total and Permanent Partial disability benefits. Any combination of the appendages above. When a qualifying employee suffers a permanent and total disability, then the employer or insurance provider is responsible for making benefit payments. 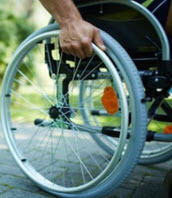 Permanent total disability benefits have a minimum of at least $25. Otherwise, the employer or the insurance provider must pay two thirds of the worker’s pre-injury wages. Though permanent total disability benefits cannot exceed two thirds of the average weekly wage across Maryland. Federal Benefits — If an injured employee is entitled to certain federal disability benefits, then permanent total disability benefits may be reduced accordingly. Permanent partial disability benefits are appropriate when a covered employee suffers a permanent injury that does not result in total impairment. Stated otherwise, the employee can still perform certain job functions. But the employee is not necessarily capable of returning to their pre-injury working capacity. In most cases, employees who suffer permanent partial disability benefits must receive at least $50 in weekly compensation. There is an exception. If the employee made less than $50 per week before the injury, then their permanent partial disability benefits will be the same as their pre-injury wages. Maryland generally restricts the amount of time an employee can claim permanent partial disability benefits. Though the time limits can fluctuate based on the type and severity of the work-related injury in question. In other words, an employee who loses a finger has a different benefit timeline than an employee who loses an eye. If you have legal questions about disability benefits or other aspects of workers’ compensation claims in Maryland, it can be remarkably advantageous to reach out to a devoted workers’ compensation attorney. The Baltimore workers compensation attorneys at Iamele & Iamele, LLP feature a wealth of combined legal experience in the field of workers’ compensation, including disability benefits. If you need legal help, contact us today for a free initial consultation.